During World War II, Steven’s father Fredrick Thomas Ewart Iddles was a blacksmith's apprentice. He became skilled and competent in this trade rather than following on from his father as a fish monger, who had held the local fish shop at the lower end of the high street in Cheltenham named as ‘Iddles and Sons’. During the war Ewart met Rosetta Sabbatella who’s family ran the local Green Grocers in Cheltenham and they went on to marry and later became proud parents to two daughters and a son (Steven). After the War Ewart decided to set up his own business, ‘Cotsvale Welding and Smithing’ with his first premises on the old gas works site in Cheltenham which is now Tesco. During his time at these premises he created an established business and was well respected in the local area. Up until the 70’s Ewart also worked as a farrier. In 1968 Ewart and Rose moved to Forge House where the business stands today. From the age of 3, Steven was always found hanging around with his father in the Forge learning about hand forging iron, it was at this age he made his first piece of ironwork! Steven went on to an apprenticeship at Hereford Technical College after leaving school as well as working with his father. At the age of 25 Steven was offered a few weeks work out in Kentucky, USA. Here he gained more knowledge and expertise and upon his return decided to start trading alongside his father as ‘Distinctive Ironwork’. You would still find Ewart and Steven working alongside each other up until Ewart’s retirement at the age of 73 in 2001. Sadly Ewart and Rose passed away in 2014 but Steven is and will continue the family trade for many years to come. 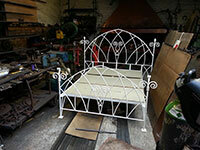 A bespoke double bed frame. A custom built garden bench. For more furniture examples Click Here.